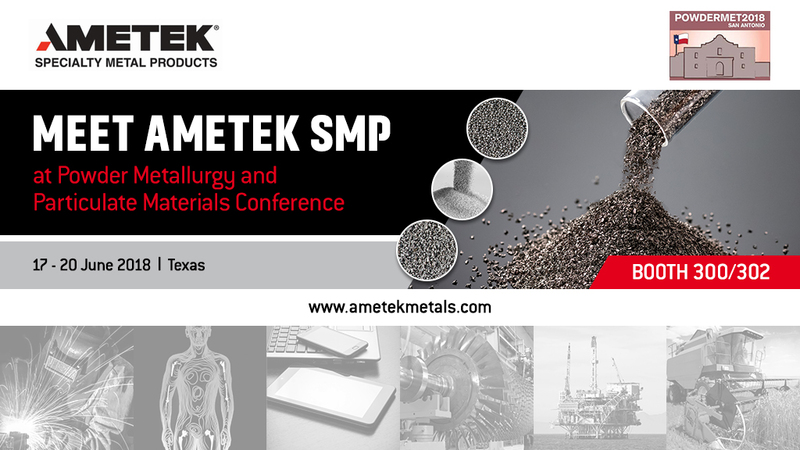 AMETEK Specialty Metal Products (SMP) will be exhibiting at POWDERMET2018 being held in San Antonio, Texas from 17th to 20th June. Bringing together PM professionals and decision makers from around the world, this is the largest annual event in North America to showcase leading suppliers of powder metallurgy, particulate materials, and metal additive manufacturing process equipment, powders, and products. For AMETEK SMP, this will be an excellent opportunity to demonstrate its world-leading expertise in the development and production of Water Atomized, Gas Atomized and Titanium Powders. In particular, AMETEK SMP has built a reputation for its unique flexibility in customizing specialty alloy powders for critical applications that demand the highest temperature resistance and the highest purity levels. In addition to networking with existing customers, AMETEK SMP is looking forward to promoting its capabilities, particularly in the area of additive manufacturing, to potential new clients. The trade exhibition is co-located with the conference AMPM2018: Additive Manufacturing with Powder Metallurgy of which AMETEK SMP is a charter member.